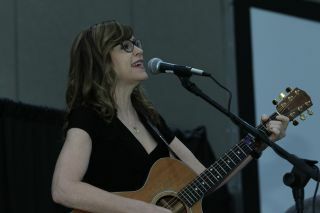 2018 GRAMMY award winner Lisa Loeb performed at the Women in Consumer Technology Luncheon at CEDIA Expo 2018. Here are five takeaways from her. “We used to have to get in the car and drive and save up money to buy an album to listen to a song. Our kids are very instant. In the kitchen: ‘Alexa, play Meghan Trainer.’ The part I’m most concerned with is that in the quickness they’re able to get the song, they want to change the song really quickly. Sometimes they won’t listen all the way through the song. So my husband and I have a rule where if you choose it, you listen to it. Just like all rules, they aren’t always listened to. But that’s something that’s really important to us. We feel like it’s not good for your brain to just switch to the next thing."